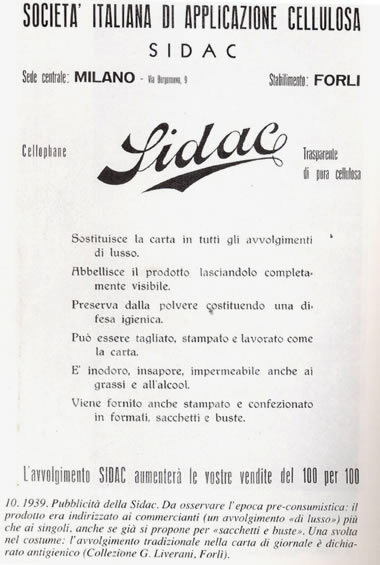 SIDAC is the daughter company of the famous Orsi-Mangelli of Forlì. The Orsi Mangelli family is one of the eldest aristocratic families of Forlì, its most famous ancestors were well known people in the Middle Ages; among them a famous architect who built the bell tower of the Forlì’s cathedral, San Mercuriale in the city center and an eminent cardinal. 1929. Count Paolo Orsi Mangelli founded the company of the same name, which was specilized in the production of cellophane; he decided to build the plant in the suburbs of the city. Lots of letters between Count Paolo and Mussolini give details of the dictatorship positive attitude towards the company foundation, which had been supported by the regime from its very beginning not only financially. Anni 30'. Workers were recruited according to the fascism ideology selection while directors had to be compulsory enlisted “in the party”; in 1931 the company employees were already 1500, most of them being women and girls aged under 16. In town a job at the Orsi-Mangelli had been considered for years long as “a meaningful achievement“ and not only a “regular job” so that saying “He climbed up to Mangelli” was of common use and this meant that the people working at the company had achieved a higher status. In addition to Orsi-Mangelli two companies for the cellophane extrusion were founded: SAOM and SIDAC. In 1930 they already had 400 employees. In the following years Sidac planned a department for the cellophane and linter nitration and started planning the foundation of Faenza’s hosiery factory, the Omsa factory. 1938. Mussolini openly expressed his support when he took part in the company official inauguration in 1938; on that occasion the company got the profile of “national company” according to the government autarchic policy. Thus following the government new laws Forlì was declared national seat of the yearly textile fibers exhibition, in which the town got a leading role. The new situation brought about a relevant change for Forlì and Romagna, a region till then featured by strong rural traditions and an agriculture-based economy. The change concerned both the economic and social structures: the town planning got totally different, the industrial districts replaced the old suburbs and many workers moved from the countryside and the surroundings together with their families. 1967. During the period of the greatest development of the artificial fibers, Sidac was taken over by SAOM so that company’s name changed in SAOM-SIDAC. 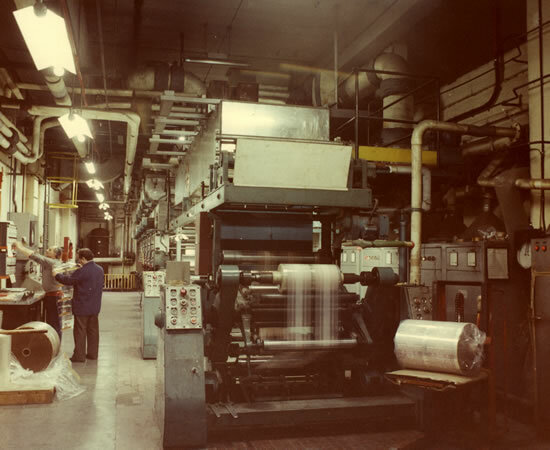 In the factory there were 5 different production lines: artificial yarns (viscose rayon), a production line that had been closed at the beginning of the 70s, cellophane films production, poliethylene films production, printing and various processing on cellophane, nylon fibers production. The printing department and the films production continued to work even after the end of Orsi-Mangelli, as the plants were moved to new areas and machines were duly renewed and converted. 1977. Fortex-Sidac survived the bankruptcy declaration of Orsi-Mangelli; in that same year the family gave up any leading role in industrial panorama. During those years, following the first health controls and analysis on workers, the local Occupational Medicine Department officially started the regular surveys and inspections on the area in which the previous plants had been working, so they found and declared the presence of asbestos and ethernit. Thanks to the first scientific literature about asbestos and the risks for the human health, that was published especially in the USA, the local Authorities started the decontamination scheme of the old area. This is one of the first project of decontamination in Italy. 1991. Fortex-Sidac was taken over by Giglioli and Ballarati so the company’s name turned into GIBA SIDAC srl. The flexible packaging printing was the only production line still working. 1992. Fortex-Sidac was taken over by ACMAR GROUP of Ravenna, a leading cooperative society in the sector of construction, that signed many remarkable projects both in Italy and in foreign countries. The new management allowed to achieve a constant growth rate which brought in 2002 to launch new product ranges such as labeling, so that currently Sidac can be considered to be a leading company also in this sector. OGGI. Today SIDAC SPA is a certified company with a turnover of about 32 ml. and 100 employees most of them being well trained and highly qualified technicians who can rely on high technology machines and engineering. SIDAC packaging is being shipped to Northern Europe, the Mediterranean countries and the USA, as the high quality printing is widely appreciated both in Italy and abroad. 19 Luglio 2017. Total acquisition of Sidac by Orienta Partners through the special purpose entity Romagnapack SpA.